I know it totally bites that I'm posting Chanukah activities after the holiday festivities have ended, but I was so not used to my new big-city life that I really couldn't keep up over holiday break!! And some crafts and activities were too fun not to share - even if you wait until next year to utilize them! 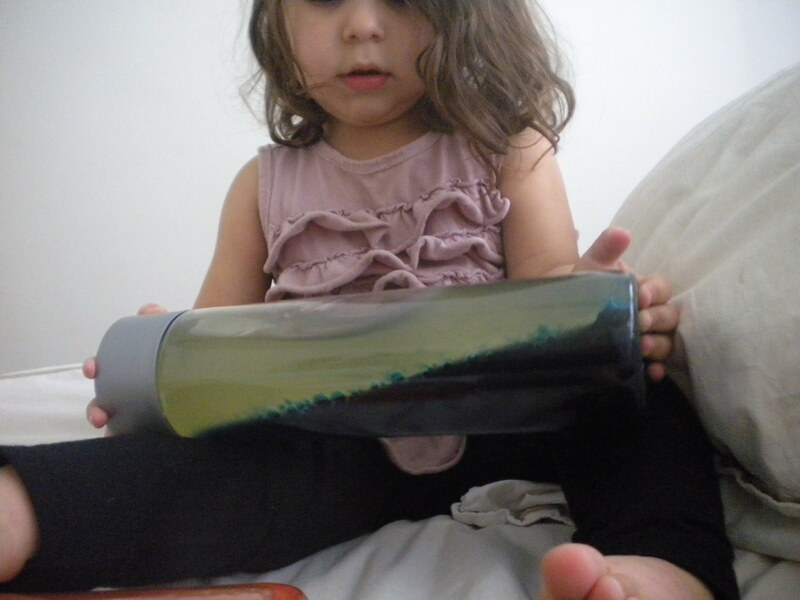 Freida had her first little chemistry lesson this week: water vs. oil. She was mesmerized! 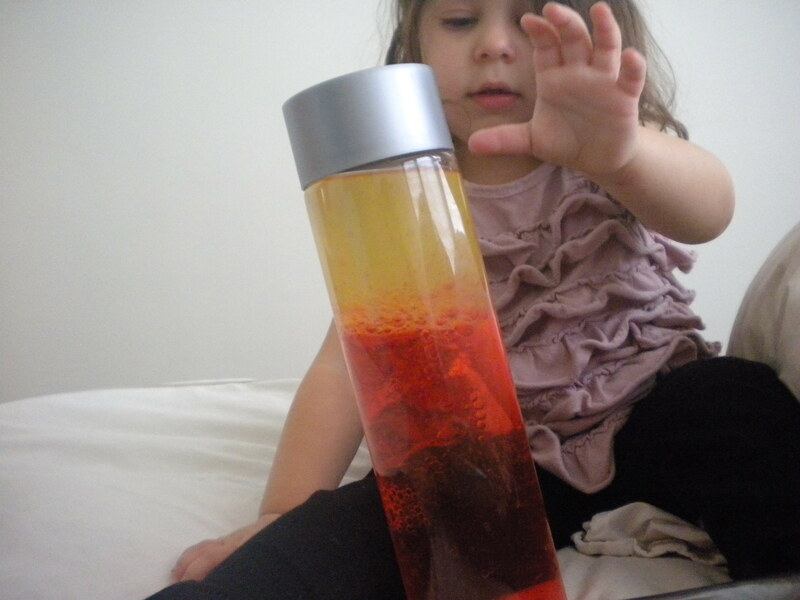 I initially made these "lava lamps" for Babyccino, and while those little guys sure enjoyed shaking the bajeebers out of these contrasting elements, there was another slightly-larger part of the lesson waiting to be explored by a little lady at home: add alka seltzer to the mix! 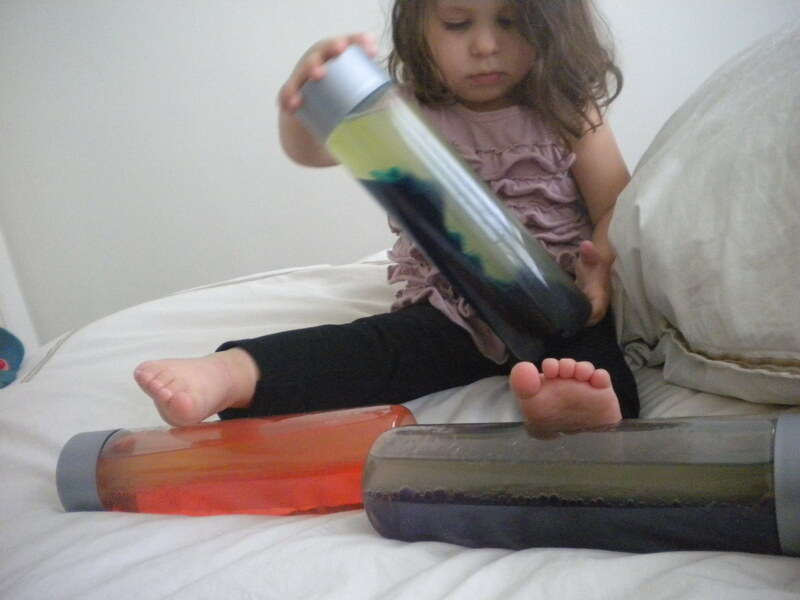 To make these lava lamps you'll need a water bottle with the label removed, oil, water, food coloring, and alka seltzer tablets. Fill the bottle with 3 part oil/1 part water. Add 10 drops food coloring (and point out the balls of color as they slowly go from floating in oil to bursting in the water at the bottom - way cool!!). Once the water is fully colored, break an alka seltzer tablet in four pieces and slowly drop them in one at a time (wait until each piece stops bubbling) - then watch the magic!! Afterwards, keep the bottles around for the kids to manipulate and discover the properties by shaking, straightening, and observing. Freida took this whole thing very seriously, and I was blown away by how long she explored the whole thing!! Definitely a great way to teach the properties of oil/water to a kid around Chanukah time, but would make a fantastic rainy-day activity for any ol' time of the year!